Track what your customers are doing after they click on your ad. Universal Event Tracking (UET) is a powerful tool that records what customers do on your website. By creating one UET tag and placing it across your website, Bing Ads will collect data that allows you to track conversion goals and target audiences with remarketing lists. Use a single tag to track and target. 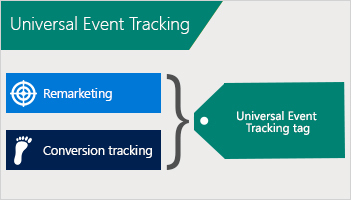 Why use Universal Event Tracking? Improve your investment: Event tracking analytics can help you optimize your campaigns more effectively by knowing which keywords convert and which ones don’t. Easy to manage: Tag your site once with just one tag. No need to create or add new tracking tags to your site each time you add a new account or conversion goal you want to track. Remarketing ready: UET tags also serve as remarketing tags, making you ready for Remarketing in Paid Search. Remarketing lets you customize your bids, ads and keywords for people who have previously visited your site. Compatibility: Tracking tags work with Google Tag Manager and other leading tag management solutions. What can I track with Universal Event Tracking? Learn more about tracking sales and other conversions using Universal Event Tracking and get started today.